Krystal Kim believes the Shower-to-Shower she used to “cut down on smells” for over 40 years was laced with asbestos leading to her ovarian cancer surgery in 2014. Kim’s asbestos-related talcum powder case is one of 22 facing a jury in St. Louis this month hoping to prove that their illnesses came from exposure to asbestos in Johnson & Johnson’s talcum powder. There are currently no federal regulations requiring that cosmetic-grade talcum powder product be asbestos-free, but Johnson & Johnson continues to deny the existence of asbestos in talc. 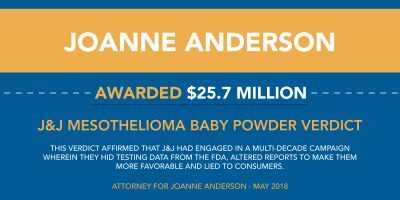 November 15, 2017 – A Los Angeles, CA jury rules in favor of Johnson & Johnson in a lawsuit brought by Tina Herford, a woman who claimed she developed mesothelioma after using J&J talcum powder products throughout her lifetime. April 4, 2018 – A Middlesex County, New Jersey jury orders Johnson & Johnson to pay $117 million in damages to Stephen Lanzo, a banker who developed mesothelioma as a result of exposure to asbestos through his regular use of talc-based products since his birth in 1972. May 24, 2018 – Los Angeles Superior Court awarded $25 million in damages to Joanne Anderson, an avid bowler diagnosed with mesothelioma that she said came from breathing in thousands of applications talcum powder used to dry her hands for 25 years. May 29th, 2018 – A South Carolina judge declared a mistrial after jurors failed to reach a unanimous decision in the case of Bertila Boyd-Bostic, who was diagnosed with mesothelioma alleged to be from her use of talcum powder from birth to her death at age 31. Bostic’s case will likely be retried. 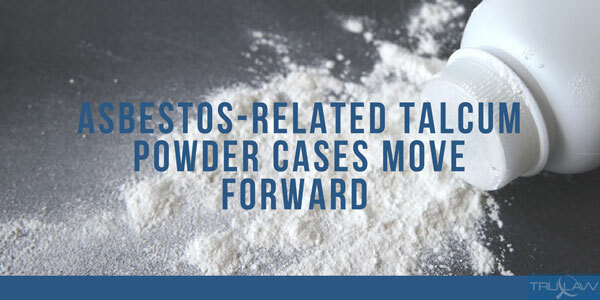 As a batch of similar asbestos-related talcum powder cases make their way through the courts, we will continue to watch the St. Louis cases and provide updates. Ovarian Cancer After Using Talcum Powder? If you were diagnosed with ovarian cancer after using Talcum Powder products as part of your daily routine, you may be eligible for significant compensation. Are you filing this for yourself or a loved one? Has your loved one passed? (Have you / Has your) loved one, been diagnosed with ovarian cancer? What age (were you / was your loved one) diagnosed with ovarian cancer? Age Diagnosed 100 99 98 97 96 95 94 93 92 91 90 89 88 87 86 85 84 83 82 81 80 79 78 77 76 75 74 73 72 71 70 69 68 67 66 65 64 63 62 61 60 59 58 57 56 55 54 53 52 51 50 49 48 47 46 45 44 43 42 41 40 39 38 37 36 35 34 33 32 31 30 29 28 27 26 25 24 23 22 21 20 19 18 When (were you / was your loved one) diagnosed with ovarian cancer? The contents of this webpage and Evaluator have been prepared by Paluch Law LLC for informational purposes only. None of the information provided on this website is intended as either legal or medical advice or opinions. In many states, this information is considered attorney advertisement. The Instant Case Evaluator is one informational resource that should be used to help users evaluate any legal rights they may have as a result of a complication or side effect. You should never discontinue using any medications or drugs without speaking to your doctor first. Do not use any information provided on this site or Evaluation as medical advice. By utilizing the Instant Case Evaluator, or the links accessible through this site, you expressly agree to be bound by this agreement. The information and the resources contained on and accessible through this site are made available by Paluch Law LLC and are subject to your agreement to their terms and conditions. No attorney/client relationship is established with use of the Instant Case Evaluator, our website or that of our affiliate lawyers, our 24/7 chat service or through submitting information via email, posting on our social media sites or calling our offices. Paluch Law LLC utilizes a number of tools to provide potential clients with instant feedback including chat services and instant case analysis. Please understand that contacting Paluch Law LLC through any one of these vehicles or via phone or email does not create an attorney/client relationship and an attorney-client privilege does not exist. Attorney-client privilege is an important legal concept that protects certain communications between a client and his/her attorney. None of the information submitted through this website, online chats, emails or phone calls is protected until we have a contract that establishes an attorney-client relationship. Our lawyers must make a case-by-case assessment of any claims and results may vary depending on the facts concerning any case. We reserve the right to decline any representation. We do not collect personal identifying information from users of this site unless provided by the visitor. Information you provide will only be used to respond to inquiries or future emails/mailings. Paluch Law LLC will not sell or give your information to third parties; we will only provide your information to affiliated lawyers for referral purposes. You will be told of any additional lawyers through your contract for representation. You are always welcome to request to have your information removed from future emails/mailings. Please understand that personal information submitted to our website via email, chat bot, live chat, submission through a survey or instant case evaluator, responding to a blog or social media post is not 100 percent secure and you should take this into account when submitting personal or confidential data about yourself. Links from this web site do not imply or state a relationship or endorsement between the linked site and Paluch Law LLC. Paluch Law LLC is not responsible for the content of any other site. Paluch Law LLC attempts to keep all information up to date and accurate but we provide no warranties as to the accuracy or reliability of the information provided on our website, on our blog or on the social media pages/accounts that we sponsor. In addition, Paluch Law LLC makes no warranties about the accuracy or reliability about the links or information provided on our site by other parties. TruLaw Instant Case Evaluator is maintained by Paluch Law LLC, LLC. Jessica Paluch Hoerman is the responsible attorney for this service. Jessica can be reached at Jess@TruLaw.com or at the address, phone number and email provided on this website.